As the fall semester picks up, time will be short and climbing trips strategic in nature. The seemingly ample leisure of an afternoon teetering across the talus of Chaos Canyon may have to give way to more focused endeavors. I have been trying to lay foundations for success by getting better acquainted with several potentially doable projects, the most recent of which is Element of Surprise. I went back up to Lower Chaos on Friday with Jenn Fields, the outdoor recreation columnist for the Colorado Daily and the Daily Camera to show her around and get to know a bit of what alpine bouldering is about. It was a fun afternoon and I got some real progress in on Element, doing all the moves including the exit crux and starting to get linkage. On Sunday, I had to stay closer to home and decided to travel up Boulder Canyon to revisit a nemesis from a while back. Hardboiled is a relatively unassuming short V11 with a steep start and a perplexing lip encounter and rockover move at the end. I fell quite badly from it one time while working it and then fell again,literally on the very last move, a few years ago. In other words I have a history with this problem. When I figured out the stream crossing(the log jam is gone) and got to the boulder, it looked pretty doable and the conditions not too bad. After a few tries, I started getting over the lip from the start and began feeling like this would go. A small refinement on beta and the next try it was done. A great sigh of relief followed. Now if I can just keep the send train chugging on a few others. Peter, congrats on the send. Just wanted to drop you a note, and say i enjoy the blog, and have really been enjoying the posts on the bouldering book site you are working on. I just finished Sherman's Stone Crusade a few months ago, and am curious if your book is going to have any type of historical element in it? 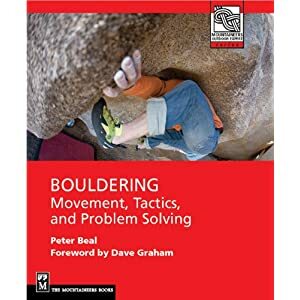 It seems like much in the last 20 years of bouldering could stand to be chronicled (perhaps this would be a separate project for someone though). Thanks J, appreciate the comment. Eric, yes I am writing a history section. For example, John Gill has said he will help with various aspects of the book.